Life insurance is pricey, in fact there are only few Filipinos who care to secure themselves with life insurance. 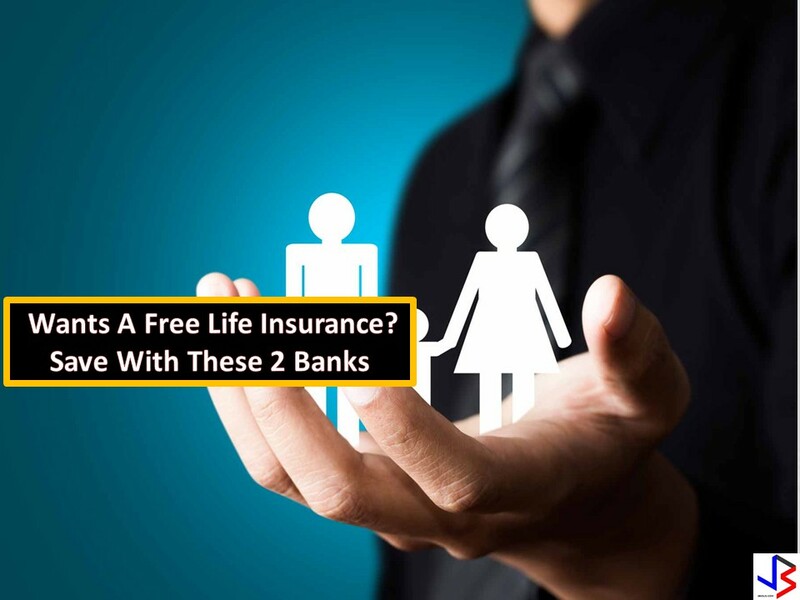 But do you know that there are some banks in the Philippines that offers FREE life insurance when you choose to open an account with them? If you will ask me, I prefer not to invest money in banks, because of very low interest rate. Savings account usually give around 0.5% interest while time deposit has around 1% interest depending on the term and amount of deposit. I did not really gave so much time as to the kinds of savings account or deposit accounts offered by different banks. 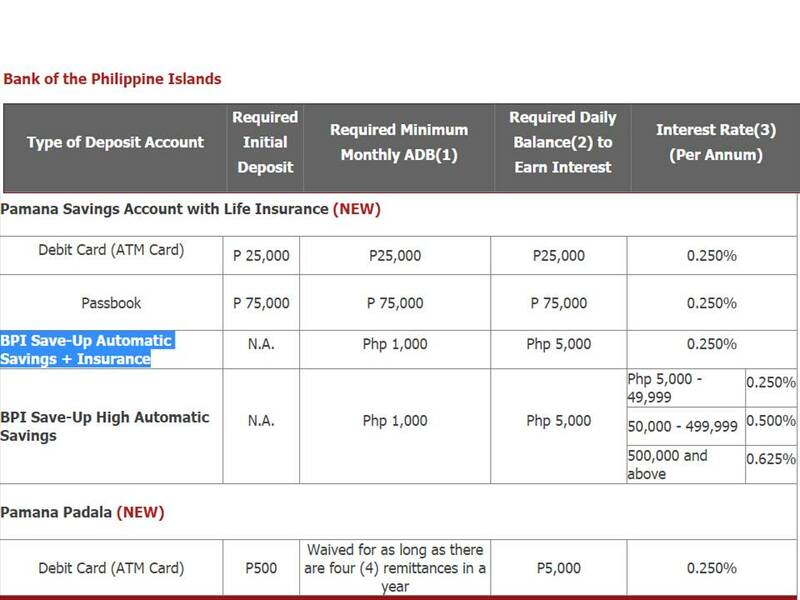 But, while checking the banks in Philippines, we found out that there are savings account that actually includes life insurance coverage. And they don't charge you for anything. Here are some options you might want to check out. So that while your money is at the bank, you could get some form of insurance in case something happens to you. BDO Kabayan Account Offers FREE LIFE INSURANCE. 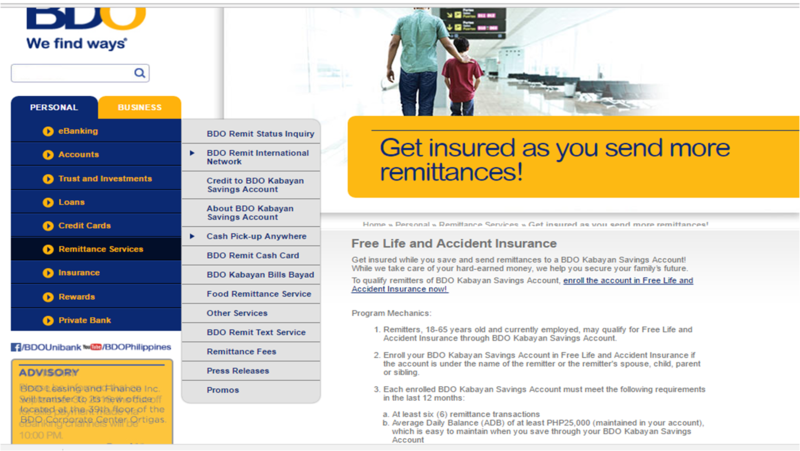 The BDO Kabayan Account gives FREE life insurance to the OFW or dependents. What is the amount of life insurance? The insured amount is 50% of average daily balance (ADB) and 50% of total remittances in the past 12 months but not exceeding Php 1 million per remitter. *Maximum benefit amount of PHP 1MM for natural death at PHP 2MM for accidental death. interpreted as to acknowledge that BDO engages in the insurance business. Am I qualified to open Kabayan Account? Remitters, 18-65 years old and currently employed, may qualify for Free Life and Accident Insurance through BDO Kabayan Savings Account. 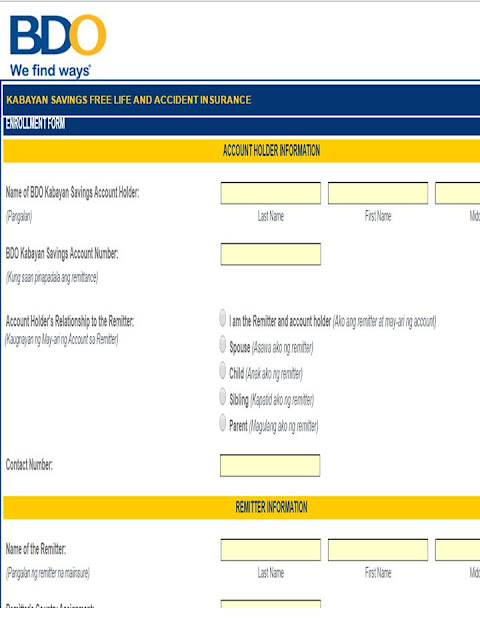 Enroll your BDO Kabayan Savings Account in Free Life and Accident Insurance if the account is under the name of the remitter or the remitter's spouse, child, parent or sibling. The enrolled remitter is covered by insurance for every month above requirements are met. The insured amount is 50% of ADB plus 50% of total remittances in the last 12 months not exceeding PHP1M per enrolled remitter. How Do I enroll For BDO Kabayan Savings Account? 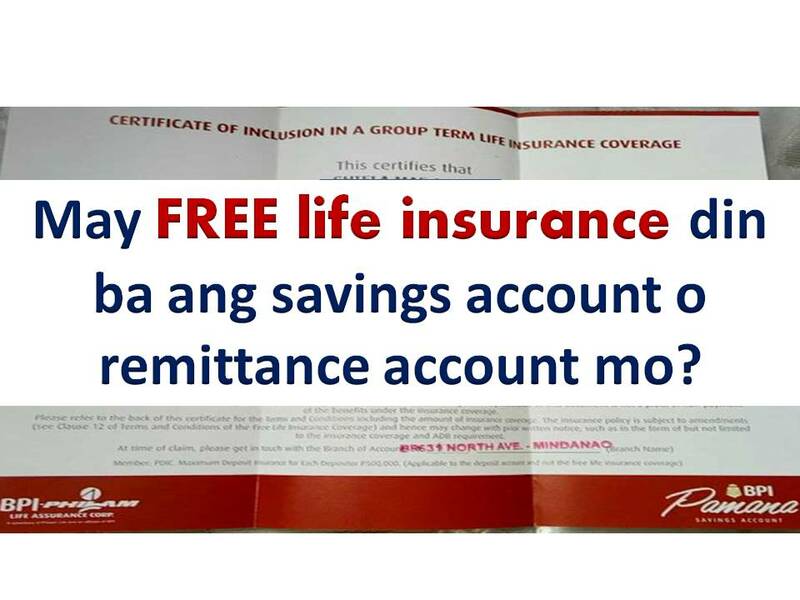 To qualify remitters of BDO Kabayan Savings Account, enroll the account in Free Life and Accident Insurance now! The enrollment is to be done online, however you may ask the nearest BDO branch to assist you on this. It is advised to bring ID or passport if you will be opening an account. Another bank in the Philippines that offers FREE life insurance is BPI's Pamana Savings Account the Pamana Savings Account is also available in BPI Family Savings Bank. Am I Qualified To Open Pamana Savings Account? ELIGIBLE PARTICIPANTS. 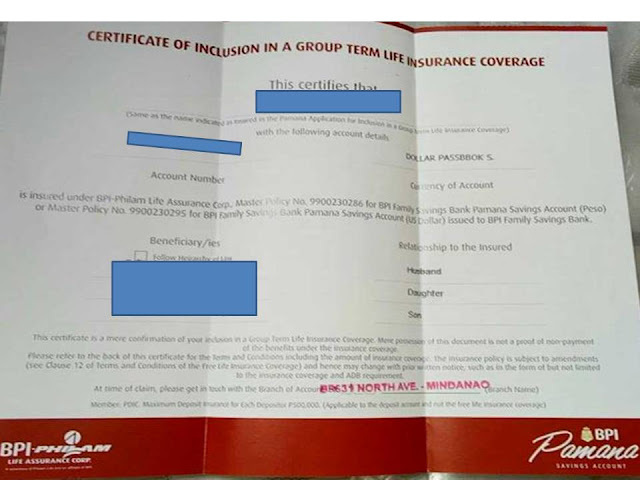 A BPI Pamana Savings Accountholder shall be eligible for a free life insurance coverage, provided the accountholder is at least 15 years old, but not more than 60 years old at the time of account opening, and his/her place of work and/or residence is not in the list of the areas or places restricted by the Company per the relevant Master Policy. For more information about the FREE life insurance of BPI Pamana Savings Account you may check here. 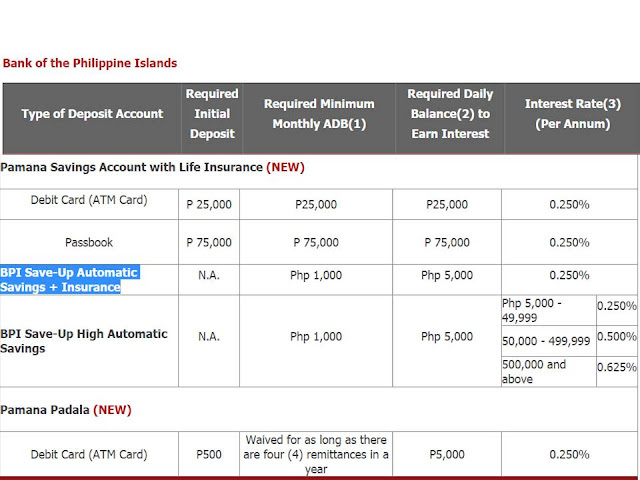 What Is The Required Deposit, and Interest Rate of BPI Pamana? 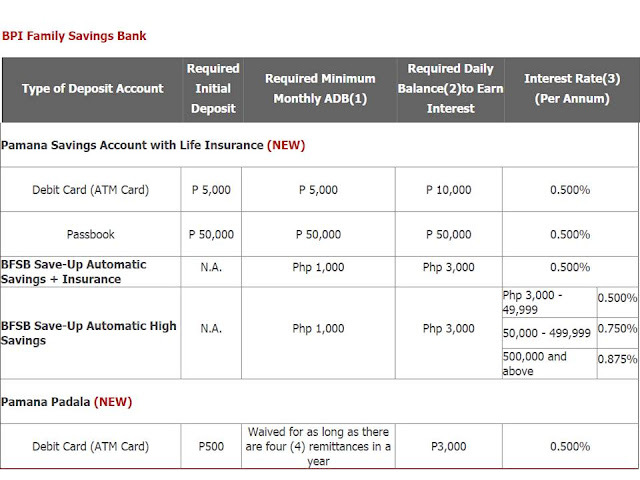 There are different variants of BPI Pamana, the table below shall give you an idea what variat should be best for you. For OFWs you can opt for the Pamana Padala. Where Can I open Pamana Savings Account With FREE Life Insurance? BPI Family Savings Bank branch near you. They will ask you for an ID or passport. Upon enrollment they give insurance certificate for your FREE LIFE INSURANCE.